Quite a lot of vintage duties have gone unreported by ‘Busman’s Holiday’ due to my house move and subsequent full time work for Crosville Motor Services. So here, dear reader, is a pictorial roundup of some of the action. This delightful scene presented itself to me while awaiting the arrival of the steam-hauled train from Minehead, West Somerset Railway. 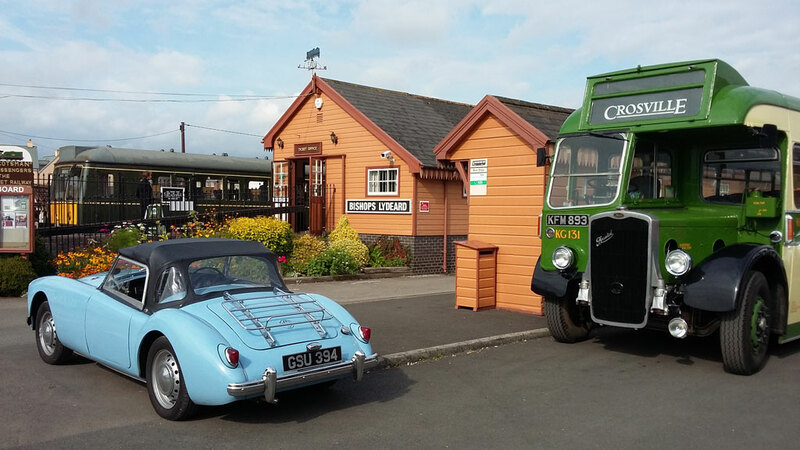 I had arrived early at Bishops Lydeard station to convey passengers to Hestercombe House and the previous departure, a 1960s 3-car diesel multiple unit, was still in the platform. Parked nearby was a pale blue MG from the same era so I couldn’t resist taking a photo! 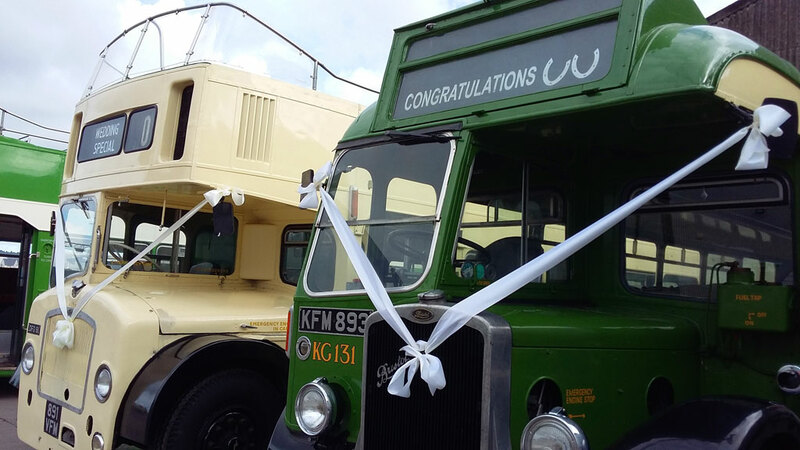 Occasionally we are asked to decorate our heritage buses for their wedding duties. This is something I always enjoy doing because I think the ribbons add a very appropriate flourish to the occasion. The day these two were photographed turned grey and drizzly so, by the time they arrived back at the depot, the ribbons were looking rather bedraggled! Sometimes the customers arrange with me to come to the depot to decorate the bus themselves. Some really go to town and bring banners and balloons as well. There are of course occasions when we get the buses wet intentionally. 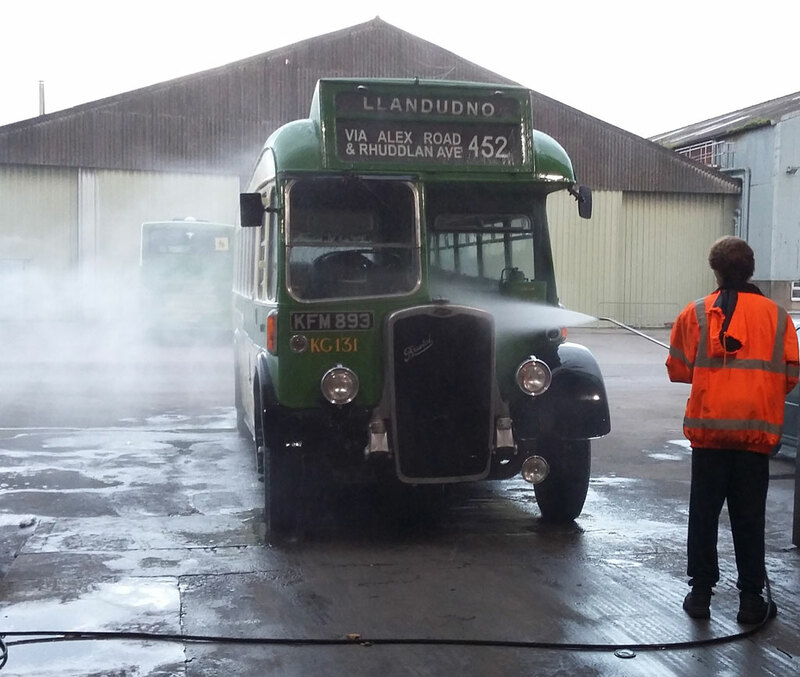 Before every outing we check that they are clean and here James, a young cleaner and occasional conductor, gets busy with our 1950 Bristol L. As we were preparing the interior of this bus we had to get rid of a poor dead mouse. The driver on its previous duty had apparently been sitting in the saloon munching on his lunchtime sandwiches when he gazed up at the ceiling and discovered a dead mouse behind one of the roof vent grilles. When James and I unscrewed the grille and retrieved said animal we found that it was completely flat, almost a fossil. It must have been there for years! Enter your email address to subscribe to "Busman's Holiday!" and receive notifications of new posts by email.